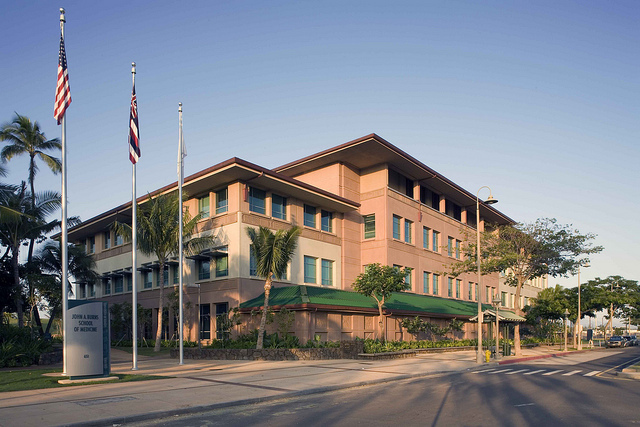 The John A. Burns School of Medicine is a fully equipped state-of-the-art research and medical education facility located at the Kaka‘ako campus, near downtown Honolulu. The Department of Tropical Medicine, Medical Microbiology and Pharmacology is located on the third floor of the Biosciences Building (BSB) on this campus. The BSB has 213,000 gross sq. ft. of space, including 184,142 sq. ft. of research laboratories and gross anatomy facilities. The adjacent Medical Education Building (MEB) of 114,546 sq. ft. houses classrooms for medical and graduate education courses, the medical school’s administrative, fiscal, and research services offices. The MEB also features a clinical skills center, grid access-3D room, patient simulators, and a 150-seat auditorium. The New Cancer Center building adjacent to MEB opened in Spring 2013 and houses ~200 researchers. 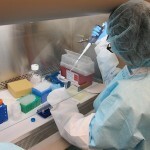 Researcher working in BSL-3 laboratory. JABSOM BSB consists of laboratories, laboratory-support functions (including BSL-3 and ABSL-3 suites), offices and conference areas for researchers and student trainees, and a vivarium and BSL-2 insectary for small laboratory animals and insects, respectively. 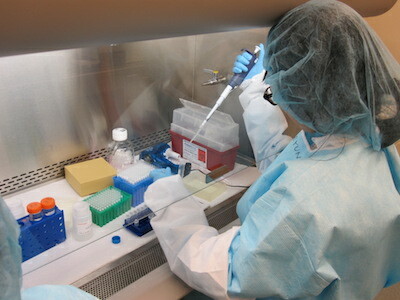 The research laboratories were designed as “open space” facilities to increase opportunities for student and faculty interactions. 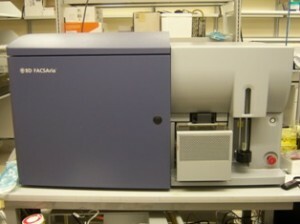 Equipment in the Immunology Core includes a 3 laser, 14 color FACS Aria sorter.